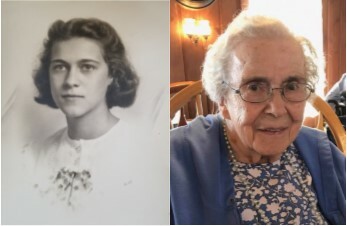 Casco, ME - Roberta Dow Giampetruzzi, age 93, passed away peacefully at her daughter, Nina’s, home on Panther Pond in Raymond, Maine during the early morning hours of Friday, May 25, 2018. Roberta was the first child of Mildred Plummer Dow and Robert E. Dow born October 13, 1924. She was born in Brunswick and raised in Augusta. She had one sister, Arolyn Dow Antognoni. From an early age, Roberta demonstrated a strong curiosity or learning and academics and a force of will to set and accomplish goals. She often recalled with pride an early success to become the first chair violinist in the Cony High School orchestra. She received Bachelor of Arts Degree in Romance Languages from the University of Maine, Orono. An accomplished seamstress and knitter, she made her own clothes and knitted countless sweaters for family members (often from wool of her own sheep). She delighted in cooking and was known for her agility in preparing delicious meals with only a moment’s notice upon the unexpected arrival of family members or guests. With more notice, her meals, influenced by her husband’s Italian heritage, were legendary. Roberta was also an adventurer and loved travelling. As an empty nester, she spent several winters in Florida. Roberta immersed herself in English culture, literature and gardens on her many trips to England and explored several other European countries. Roberta is predeceased by her husband, Nino, her sister Arolyn and her brother-in-law Robert Antognoni. She is survived by her six children, 13 grandchildren and 16 great grandchildren. The six children and grandchildren are as followsJanet Louise Blessing of Portland and her daughter Pamela (Austin) Bridges and her son David (Pamela). Peter James Giampetruzzi (Susie) of Gardiner and their son Gregory (Joyce), their daughter Angela (Ray) Young and their son Michael (Emily). David Antonio Giampetruzzi (Carol Sue) of South China and their son Anthony (Alex), David Scott (Kathleen) and their daughter Katherine (Kevin) Hogan. Nina (Robert) Kamman of Raymond and her sons Eric (Chelsea) Olson and Matthew (Melissa) Olson. Robert Felice Giampetruzzi (Joann) and their son Nicholas of Portland. Steven Paul Giampetruzzi (Ann) of Raymond and their sons Michael (Katy) and Mario. A Mass of Resurrection in celebration of her life will take place on Saturday, June 9, 2018 at 10:00 am in the Chapel of the Cathedral of the Immaculate Conception, 307 Congress Street, Portland. Refuge League of Greater Portland, or the Good Shepherd Food Bank.